Dear Husbola and I are on the hunt for interesting paintings. We are gaining an identity at the Odana Mall as the space for interesting paintings--so it keeps us on our toes to track down art that we can sell reasonably. 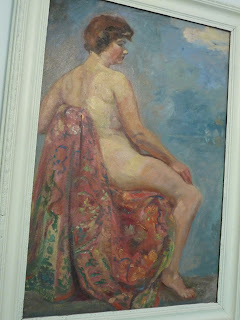 I love buying vintage naked lady paintings. You will be hard pressed to get me to sell them on--I want to keep them for our bedroom and bathroom walls. Allow me to introduce you to three of our gals today. These lovely pink flowers pop up every summer. I think they are amaryllis--but I know them as "Naked Ladies". 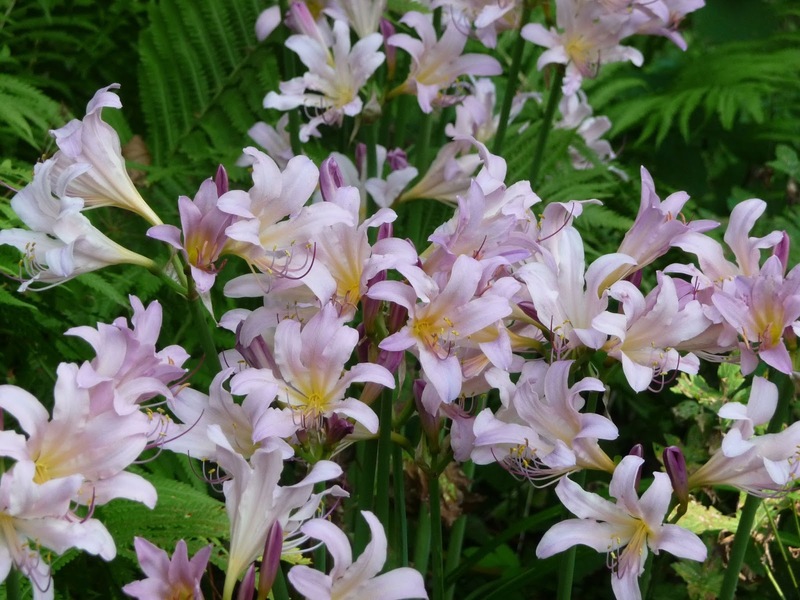 I always thought so because they do not have fronds at this time of year--they just send up a shoot and these fabulous underside of a shell color pink. If you know their real name--don't tell me. This woman of a certain age is sitting on a fabulous oriental patterned rug or drape. We found this in England at the Junkiest-Shop-Ever in a town north of London. None of these ladies are in your face with it. Demure and tasteful we think. Don't expect to see any of these gals or their sisters in our shop or at a show. They live quietly with us in the woods. 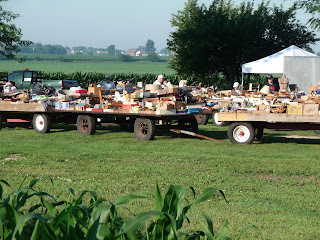 "You Only Have Scraps Left"
The nice lady who sells across from us at the Elkhorn Antique Flea said that to me after last Sunday's show. She is a great lady who sells redone furniture and has been selling at Elkhorn for 38 years. It is about time that Dear Husbola and I had a gangbuster sale. Elkhorn for us has been "middlin" this year, until last Sunday. Conventional wisdom has always said that the AUgust Elkhorn is the lightest on dealers and the lightest on crowd for the whole summer season. Yes, yes all true. But they were buying. 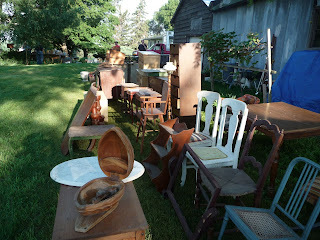 Furniture, paintings, collectibles, paper, glass, all of it. No pictures, sorry. 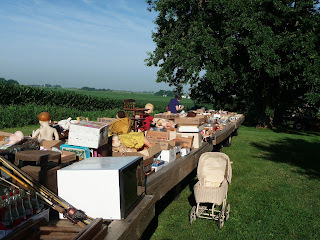 We started selling the minute we opened up the truck and started unloading. Dealers around us were also reporting strong sales. I got my Lions Club brat. Dear Husbola got his golden maple root beer and popcorn. I bought a cute vintage purse. We buy most of our inventory these days at midwestern auctions. Figuring out which ones to attend has become an art--and we especially want to attend those that sell estates. Let's face it. 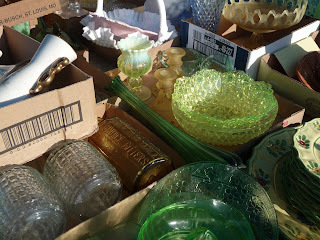 If you like vintage things--they all belonged to somebody else once and chances are the previous owners have died. Just like someone will someday own every thing in my house. 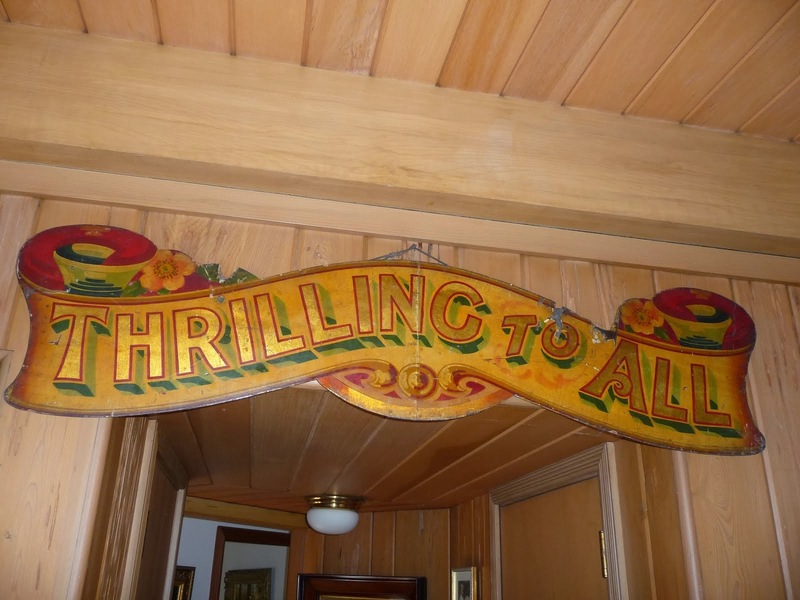 The every rolling stream of life and decorating with vintage and antiques. And the million stories that each item could tell. We recently bought a little table--and the drawer was not empty. It contained the above--three matchbooks and a little green pencil. The odd thing about two of the matchbooks--is that they were photo covers over a matchbook advertising something completely different. The covers said Eddie Condon's and they were covering matchbooks from Manor House Hotel on South Parkway in Chicago. "Inviting, friendly, comfortable." Eddie Condon was a jazz banjoist and guitarist and specialized in the Chicago style of Dixieland jazz. His last album was with Louis Armstrong. He had a club in New York. The Manor House Hotel is no longer--and it was a house hotel on the south side of Chicago. 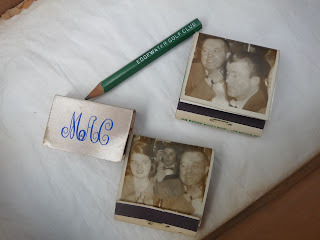 The third book of matches was the kind that ladies of leisure ordered with their initials--these MAC-- and they sprinkled around their living rooms and had on the bridge or rummy royal tables in the 1950s. The little green pencil says "Edgewater Golf Club" which is no longer and was on the north side of Chicago. We have a junk drawer in the kitchen that contains 100's of little bits and bobs and inconsequential items. Unless I clean that out--a future generation of antique dealers will go through that and wonder about all the stories contained therein. 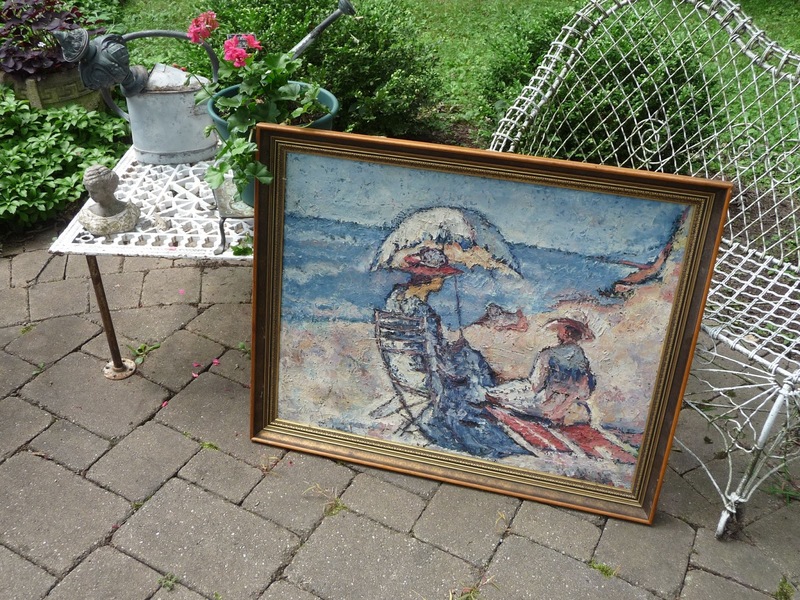 We are on a water and beach themed buying streak for oil paintings these days. Looking at beach themed paintings is very restful. We buy them whenever we see them--and we are selling them at Odana Antiques in Madison Wisconsin. We hang them up--and they sell. FAST. We just returned from a restock trip--and within 24 hours--we had sold seven things we had just put in--including a wonderful water scene oil--the skyline of Chicago from the vantage of being in Lake Michigan. Lovely. Sold too fast--I don't have a photo for you. Summertime paintings sell well--much better than winter scene paintings. Spring sells better than autumn themed oils. 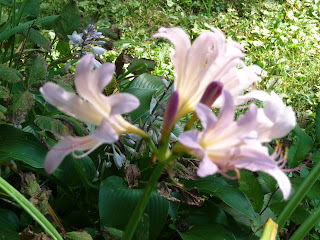 Maybe it is the longer days and brighter scenes and the good feelings that spring and summer spread. People want those on their walls. 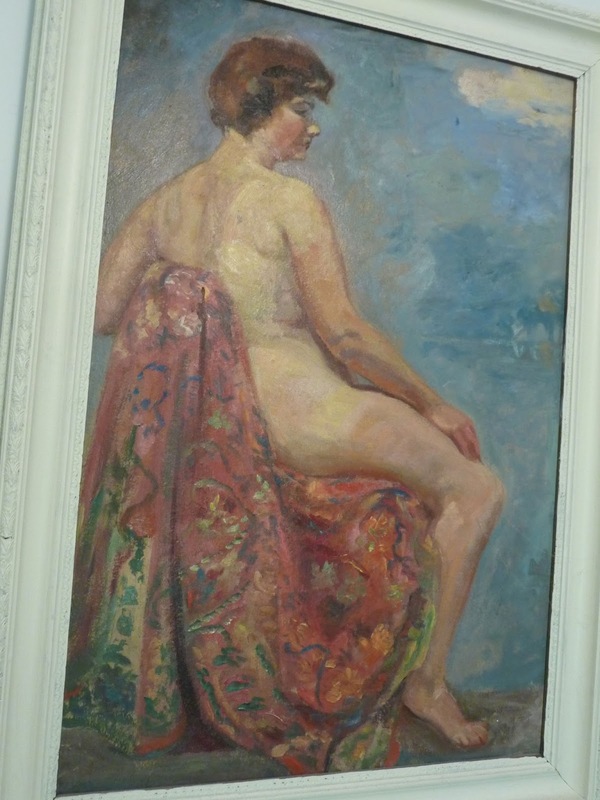 The painting above is by a french artist--and was probably purchased while the previous owner was on holiday there. I wouldn't mind hanging it in our house for awhile. 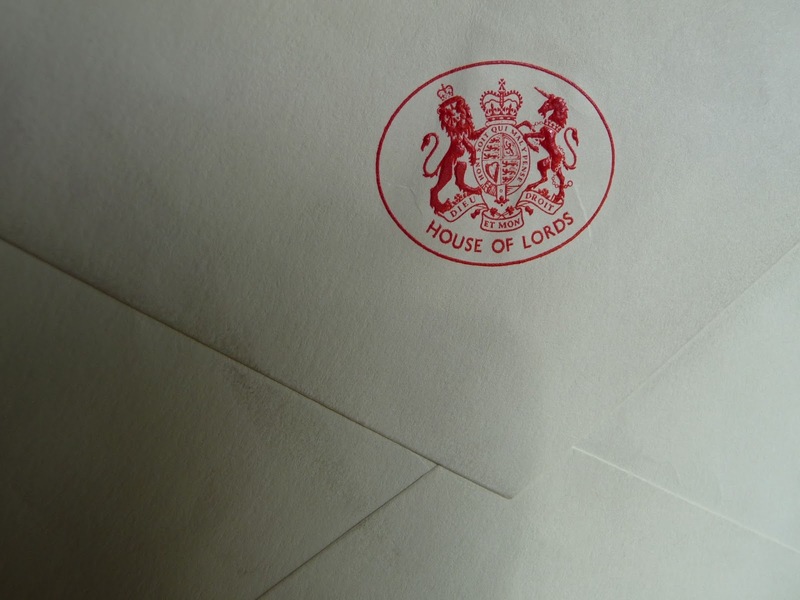 A final chapter in my three part blog about Lady Eirene White, my friend for more than 15 years and member of the House of Lords--who I met on a train from Edinburgh to London while I was a student at the University of London. After returning to the US to begin my legal studies in Chicago, Lady White proved to be a vigorous correspondent. 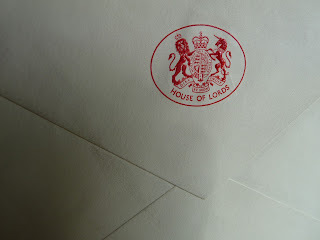 On another occasion we stayed in Lady White's London flat while she was away and on another, she invited my mother to have a tour and lunch in the House of Lords' dining room. We encouraged her to visit us on one of her frequent trips to the US. Plans changed often--but we were able to host her at the Plaza Club in Chicago for a lunch between flights--although fog prevented the spectacular lake and skyline views. Lady White died in 1999 and we learned too late to attend her remembrance service at Westminster Abbey. I have often paged through her letters--that are sprinkled with news about Mrs. Thatcher and the Falklands and a visit from President Reagan. She may not have shared politics with the President, but she was enamored by him nonetheless. My life has certainly been enriched by that chance meeting on a crowded train in 1981. Regular readers to this blog know that there is nothing Dear Husbola and I like more than a real old fashioned farm estate auction. They are getting so scarce. 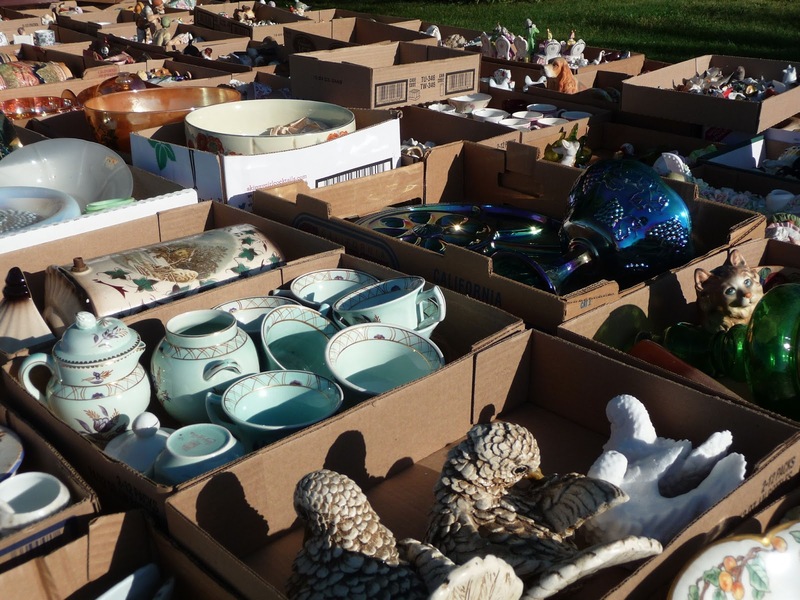 Most auctions these days are consignment auctions. That means any number of consignors can hand things over to an auctioneer to add with other people's items and then an auction is held. THE BEST types of auctions are one consignor, a huge load of stuff, a beautiful summer day and a loaded car coming home. On a gorgeous recent summer day--there was a fabulous auction ina nearby town. Within 30 miles is a real gift--no getting up at 4am. Dear Husbola was out of town on a rare trip--so I was solo. I arrived at the site more than an hour ahead of auction start. I was rewarded with a parking space across from the farmhouse. SCORE! 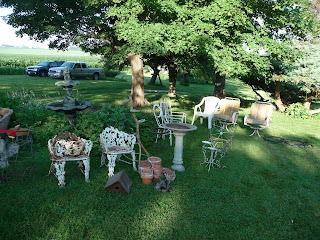 Quirky stuff, normal stuff--12 wagons and furniture and paintings that snaked throughout the yard and around several out buildings. 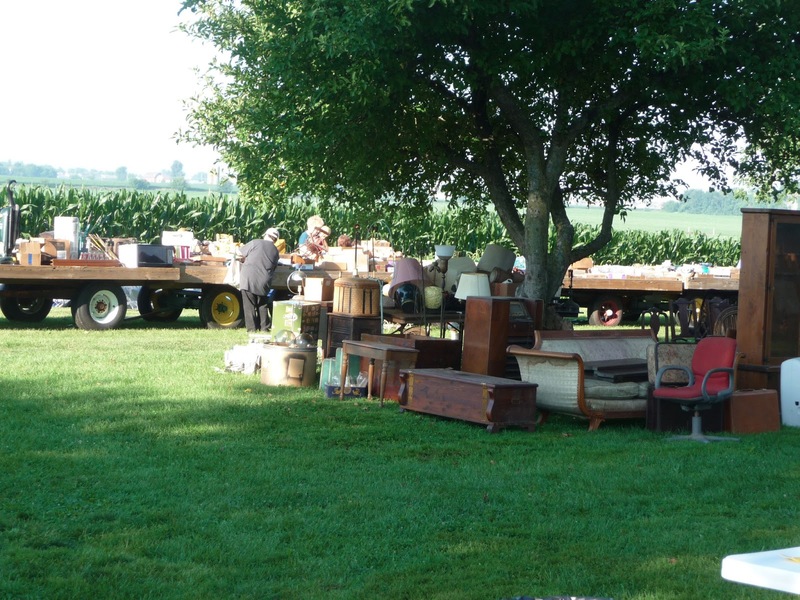 One little caveat to an estate auction--there may be family and heirs attending who are bidding just like everybody else. You have to hope that what you want is not that Special Little Widget that they want that grandma had. 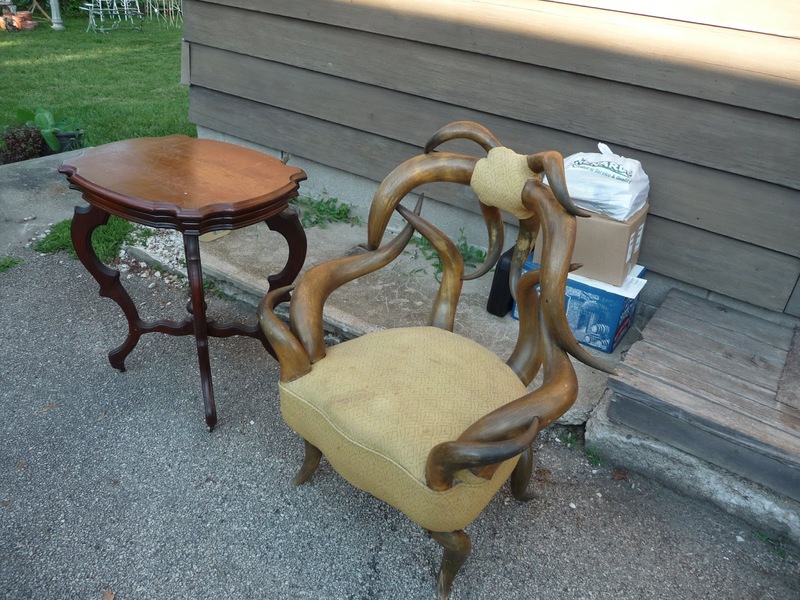 That great horn chair? One of those items. DRAT. The heir would not be denied. I filled the truck. Was tired and dirty and in bed by 8pm. GOOD DAY.